The prime minister of Uzbekistan, Abdulla Aripov, flew to neighboring Kyrgyzstan on August 16 to further break the historic frostiness in ties and overcome remaining points of contention, such as yet-unsettled border delimitation. The intergovernmental encounter in Bishkek was the first between the two nations in eight years. Inability to agree on national boundaries has been a major sticking point in relations since the fall of the Soviet Union, but diplomacy has picked up swiftly since the death last year of Uzbekistan’s late isolationist president, Islam Karimov. Clashes had taken place regularly among residents of border areas and those troubles have on occasion dragged in troops from the respective countries. In the most recent confrontation, in the summer of 2016, troops from the two countries faced off in a dispute over ultimate ownership of the Kasan-sai reservoir, in Kyrgyzstan’s Jalal-Abad region, which is claimed by Uzbekistan. At the height of the crisis, Uzbek police in effect kidnapped a group of Kyrgyz technicians and occupied a telecommunications tower. This move sparked rage among residents of nearby Kyrgyz villages and raised fears that local communities might take action into their hands. The background music has changed drastically since that time. In July, for example, scheduled flights began between the Uzbek capital, Tashkent, and Kyrgyzstan’s Issyk-Kul region, a popular tourist destination. During his meeting in Bishkek with Aripov, Kyrgyz PM Sooronbai Jeenbekov said that the flights would ensure Uzbek people could easily and conveniently travel to Issyk-Kul. Jeenbekov stressed that it was a priority now that the two nations begin to cultivate friendly relations. “The development of good neighborly relations with Uzbekistan is a priority area for Kyrgyzstan’s foreign policy. 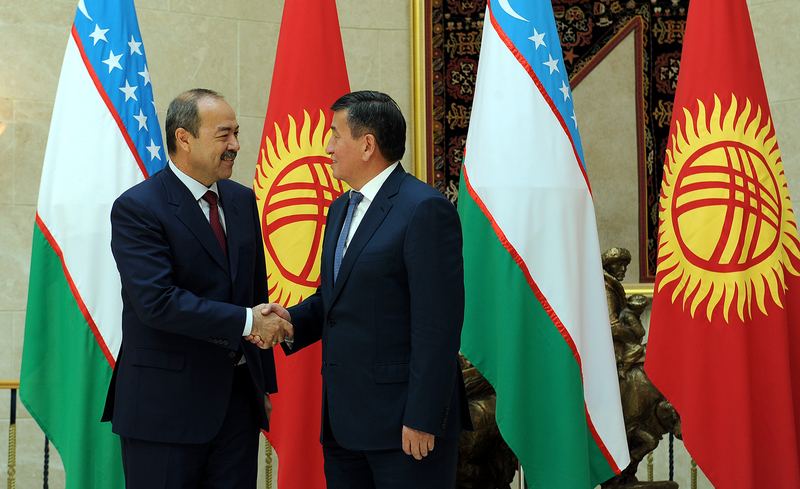 It is gratifying to note the intensification of ties aimed at the development and strengthening of Kyrgyz-Uzbek cooperation,” the Kyrgyz prime minister said. Aripov responded with accordingly upbeat language. “This year we propose organizing a season of Uzbek culture in Kyrgyzstan. And in 2018 we hope to hold a season of Kyrgyz culture in Uzbekistan. It has been a long time since we had an exchange of our film collections, so I think it is also necessary we organize film days too,” he said. Aripov had an impressive array of officials in tow, including the foreign minister, the trade minister, the presidential envoy for border limitation affairs, the deputy head of the National Security Service in charge of border issues, the deputy justice minister, the first deputy culture minister, the deputy head of the state railways company and the chairman of the state power company. The Kyrgyz ambassador to Uzbekistan, Daniyar Sydykov, was positively glowing with satisfaction. “The current state of Kyrgyz-Uzbek cooperation is as favorable and substantive as it has ever been in the history of our bilateral relations,” he tweeted. The first break in the ice came back in October, when Uzbek President Shavkat Mirziyoyev met with a delegation of visiting Kyrgyz officials in Uzbekistan’s Andijan region. There has been a regular trickle of encouraging news since then. In July, it was announced that Kyrgyzstan had reached a deal to supply Uzbekistan’s state power company with 1.25 billion kilowatt hours of electricity at the favorable rate of $0.02 per kilowatt hour. From the start of deliveries, on June 16, through to July 4, Kyrgyzstan supplied Uzbekistan with 192.5 million kilowatt hours — an amount equivalent to what is consumed by around 200,000 US households in a month. Earlier, in April, Kyrgyzstan and Uzbekistan drew up an agreement on around 1,000 kilometers of shared border, formally settling an undefined number of standing disputes. As Uzbek Foreign Minister Abdulaziz Kamolov said at the time, only around 300 kilometers remained to be definitively settled.